A Cost-Plus Contract is a construction contract under which the contractor gets paid for all construction-related expenses (direct and indirect/overhead costs), provided that the contractor justifies and presents evidence for the costs, plus an agreed-upon profit. 1. 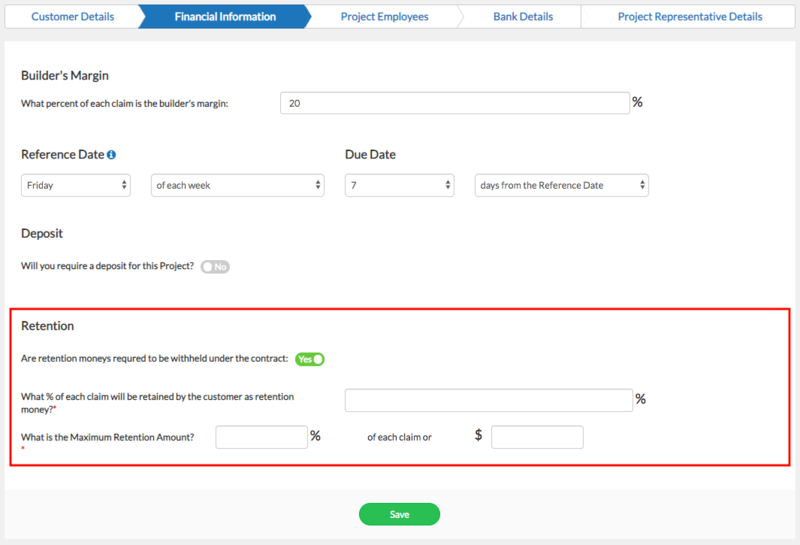 To create a Project Breakdown for a Cost Plus Project, click Create on the Cost Plus Payment Claim tile inside the project. 2. You will then land on the Project Breakdown Page. 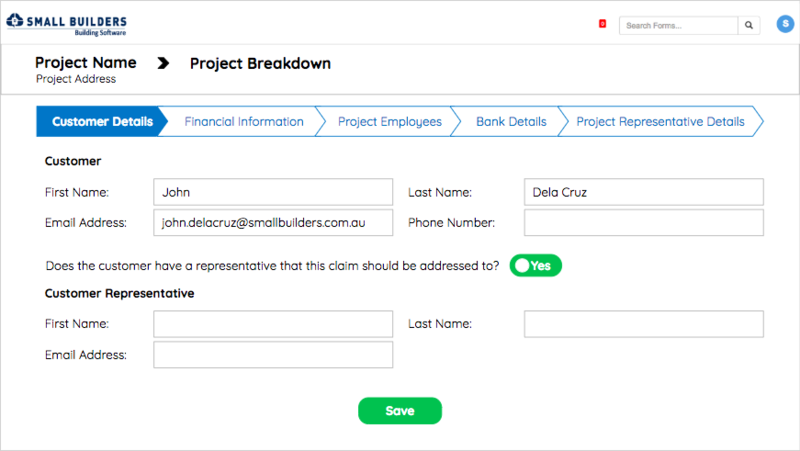 Completing your project breakdown will save you time creating your Cost-Plus Payment Claims. a. Customer Details. This is pre-populated by the Customer Details that you input on your Project Page under the Customer Details tab. These information in turn pre-populates your Cost-Plus Payment Claim Templates. Builder's Margin. This is defaulted to 20% but is updatable. This pre-populates the Builder's Margin row on the Summary table of your Payment Claim From. Reference Date. This is defaulted to every Friday of each week. Due Date. This is defaulted to 7 days from the Reference Date. You can update both from the Payment Claim Form but setting them up prior to creating payment claims will save you time submitting Payment Claims. Deposit. This is disabled by default. Click the toggle button to enable Deposit then input the Deposit Amount. This pre-populates the Deposit field on your payment claim. NOTE: Updating the Deposit status after making payment claims is not allowed. Withdraw all your existing claims to update the Deposit status. Retention. This is disabled by default. Click the toggle button to enable Retention then input the percentage of each claim that will be retained and the maximum retention. This pre-populates the Retention row on the Summary table of your Payment Claim From. NOTE: Updating the Retention status after making payment claims is not allowed. Withdraw all your existing claims to update the Retention status. This tab is pre-populated with all of your employees from your Contacts Page. Deleting employees from the Project Employees tab, will not delete them from your Contacts page. 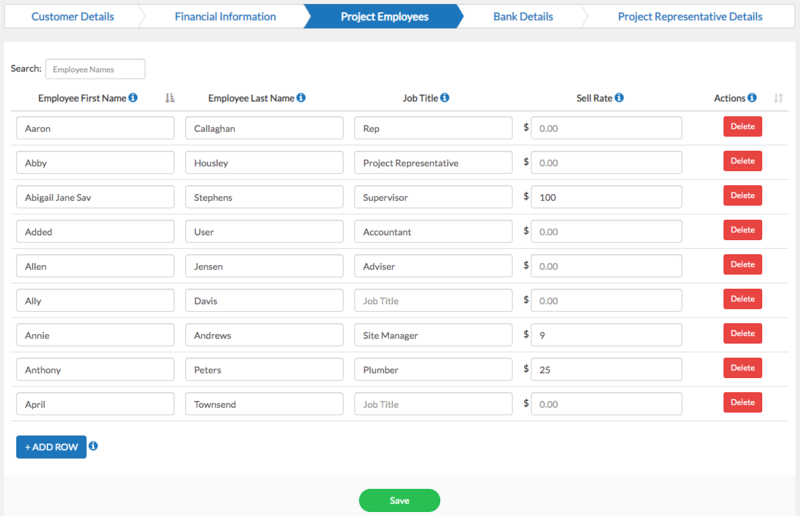 Add, customise, and manage your employees specific to your project under the Project Employees tab. Hover over the info 'i' icons to learn more about each column or item. New employees added under the Project Employees tab do not reflect on your Contacts Page. 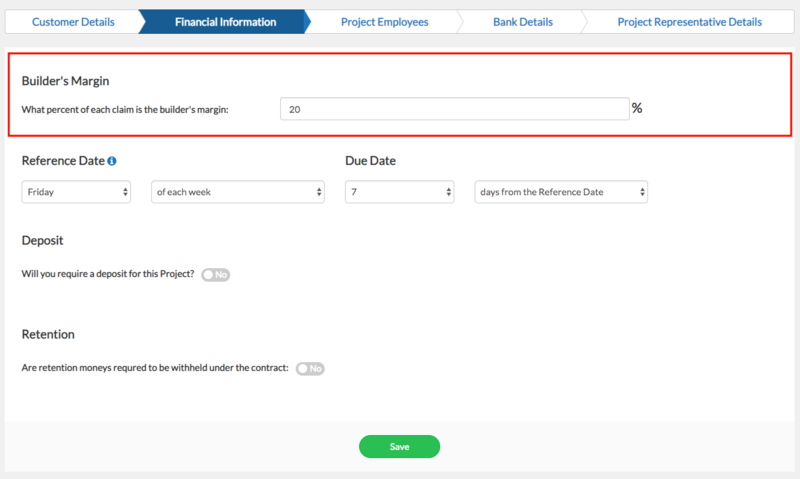 Added employees on the Contacts Page after creating the Project will not reflect under the Project Employees tab of the project. However, you can add that employee to the project through the project's Project Employees tab. 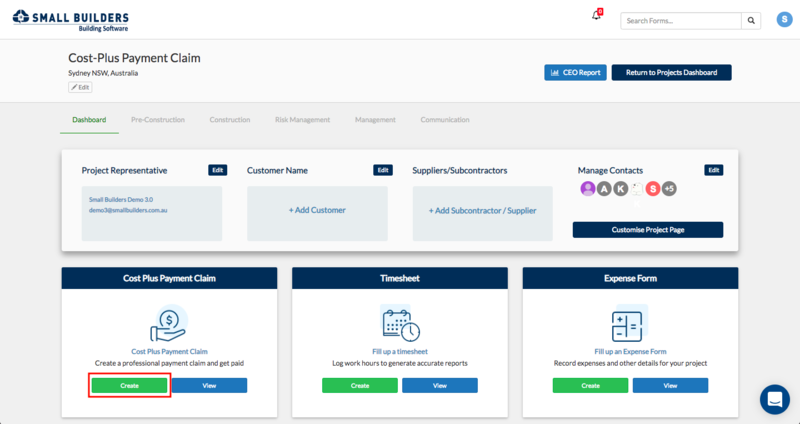 This tab is pre-populated with the Bank Details that you input on your Business Info page which in turn pre-populates your Payment Claims Templates. 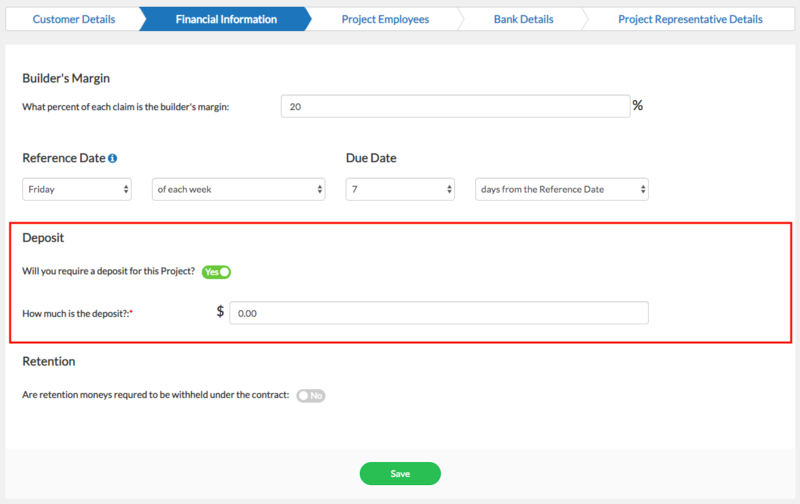 The Bank Details fields on the Project Breakdown are editable. 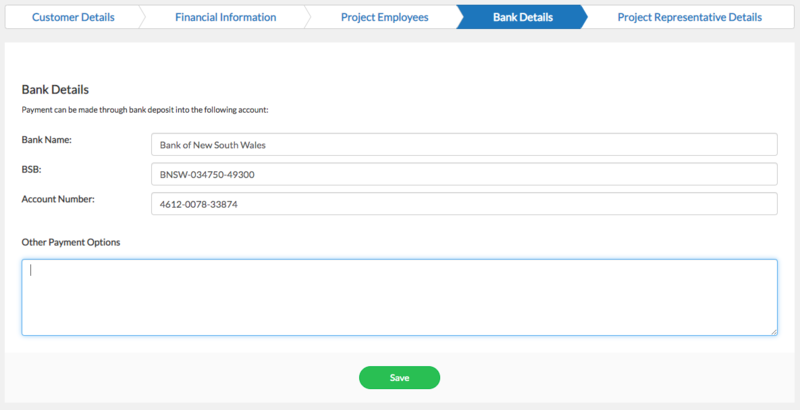 Changes to the Bank Details on the Project Breakdown do not reflect on the Business Info page. Add alternative payment options under the Other Payment Options field. This tab is pre-populated with the Project Representative Details that you input on the Project Page. Changes to the Project Representative Details under this tab do not reflect on your Project Page. 3. Hit Save and start Creating a Cost Plus Payment Claim.